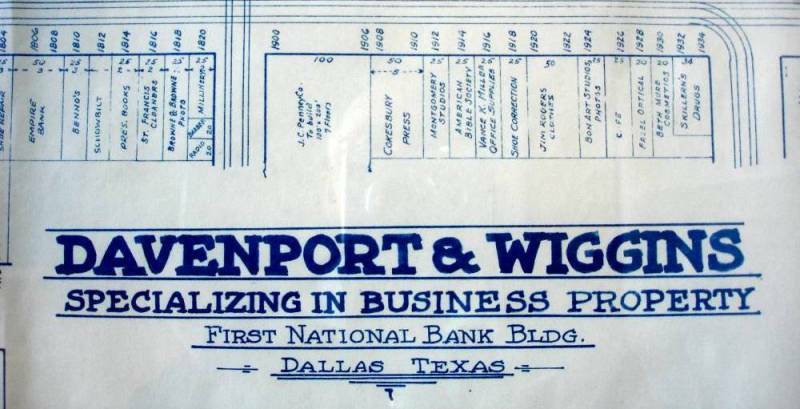 Davenport and Wiggins specialized in the property management and leasing of retail storefronts in the Dallas Central Business District, until the retirement of the partners. Each of the partners, Howard H Davenport and Harvey W Wiggins,had worked five years for Pat Murphy & Company beginning in 1927. The Davenport and Wiggins partnership was formed in February of 1932, officing in suite 1509 of the First National Bank Building. In 1952, the company moved to suite 1108 of the Kirby building. They stayed there until their retirements in the 1970s. At that time, the street level retail storefront trade in downtown Dallas had evolved into less than a shadow of what it once had been. While many of the towers and redevelopments that were built in the District contained retail of one kind or another - including the tunnel system linking various blocks and buildings, the street level storefront footage was decimated as it gave way to new construction. Images on this and following pages are taken from a plat of an area bounded by the streets of N. Lamar, Pacific Ave., N. Harwood, and Commerce St. The plat dates from the late 1940s, a time when street corners in the Central Business District would be packed with people trying to get from one side of the street to the other. Pages following illustrate the retail storefront populus, on a block by block basis. What is evident from a review of the plat is the demise and disappearance of the illustrated retail storefront lease space in downtown Dallas. Generally, this began in the late 1950s. One school of thought is that the growth of suburbia and retail malls were the beginning of the "end" for this retail trade - marked by the opening of Big Town Mall in 1959, the first enclosed mall in Texas. Most of the smaller retail storefront footage is now completely gone and has been replaced by parking lots, open spaces, and office towers. Although the office towers brought in more "workers", their shopping migrated to the suburbs...to places like Big Town, then North Park, and others later. No discussion of the merit of this evolution of downtown retail shopping is attempted here - occupied/ vacant/ questionable condition storefronts certainly exist today. There is no attempt to identify in detail the chronology of change in this area or redevelopment. The intent here is simply to illustrate a little history of the Central Business District. Southbound Central Expressway in 1959. Big Town was just about to open, and North Park was just a plowed field. Principal Dallas shopping was still the Downtown Central Business District.